Immunotherapies have shown considerable efficacy for the treatment of various cancers, but a multitude of patients remain unresponsive for various reasons, including poor homing of T cells into tumors. In this study, we investigated the roles of the leukotriene B4 receptor, BLT1, and CXCR3, the receptor for CXCL9, CXCL10, and CXCL11, under endogenous as well as vaccine-induced antitumor immune response in a syngeneic murine model of B16 melanoma. Significant accelerations in tumor growth and reduced survival were observed in both BLT1−/− and CXCR3−/− mice as compared with wild-type (WT) mice. Analysis of tumor-infiltrating leukocytes revealed significant reduction of CD8+ T cells in the tumors of BLT1−/− and CXCR3−/− mice as compared with WT tumors, despite their similar frequencies in the periphery. Adoptive transfer of WT but not BLT1−/− or CXCR3−/− CTLs significantly reduced tumor growth in Rag2−/− mice, a function attributed to reduced infiltration of knockout CTLs into tumors. Cotransfer experiments suggested that WT CTLs do not facilitate the infiltration of knockout CTLs to tumors. Anti–programmed cell death-1 (PD-1) treatment reduced the tumor growth rate in WT mice but not in BLT1−/−, CXCR3−/−, or BLT1−/−CXCR3−/− mice. The loss of efficacy correlated with failure of the knockout CTLs to infiltrate into tumors upon anti–PD-1 treatment, suggesting an obligate requirement for both BLT1 and CXCR3 in mediating anti–PD-1 based antitumor immune response. These results demonstrate a critical role for both BLT1 and CXCR3 in CTL migration to tumors and thus may be targeted to enhance efficacy of CTL-based immunotherapies. Several preclinical and clinical studies suggest a positive prognostic implication and prolonged survival advantage associated with the presence of tumor-infiltrating CD8+ T cells (1–6). Adoptive cell therapies, including chimeric Ag receptor therapy, have shown considerable efficacy in melanoma and hematological malignancies such as leukemia with an impressive 80% response rates in some studies (7, 8). A major criterion pertinent to the success of these immunotherapies is the presence of CTLs in tumors. However, one of the obstacles to the success of existing CD8+ T cell–based tumor immunotherapies, particularly in solid tumors, is inefficient homing of the CD8+ T cells into tumors. Some preclinical studies have shown that <2% of the transferred CTLs infiltrate the tumors (9–11). Vaccination studies have demonstrated inefficient tumor regression despite intact CTL responses in the periphery, a phenotype attributed to lack of efficient CTL trafficking into tumors (9, 12, 13). A tumor-suppressive microenvironment and the nature of the tumor microvasculature are some of the resistance mechanisms employed by the tumor against recruitment of CD8+ T cells (11, 14–16). Chemokine–chemokine receptor pathways are one of the major factors governing CTL recruitment to tumors and antitumor immunity (12, 17). At present, only a few chemokine receptors, namely CCR5, CXCR3, CX3CR1, and CXCR6 and their cognate ligands, have been implicated in CTL migration to tumors (18–23). CXCR3 is expressed on activated CD4+ T cells, CD8+ T cells, and NK cells and is strongly associated with Th1 and cytotoxic responses (24–28). The role of CXCR3 and its IFN-γ–inducible ligands CXCL9, CXCL10, and CXCL11 have been very well characterized in various viral disorders and in autoimmunity and transplantation studies (12). However, its role in regulating T cell migration across the tumor vasculature has been recently demonstrated as a critical mediator of T cell–based immunotherapies (29). CXCR3 and its ligands play a crucial role in antitumor immunity by having antitumor effects on tumor cells directly or indirectly through the host immune system (29–38). Another category of potent chemoattractants includes leukotriene B4 (LTB4), an eicosanoid derived from arachidonic acid (39). BLT1, the high-affinity receptor for LTB4, is expressed on innate cells as well as activated T cells and has been implicated as a proinflammatory mediator (40–45). In the context of cancer, BLT1 was shown to play a dual role in controlling tumor-promoting inflammation, as seen in silica-induced lung tumorigenesis (46), or tumor-suppressive inflammation, as shown in the TC-1 cervical cancer model (47). In this study, we examined the roles of BLT1 and CXCR3 in mediating an endogenous as well as anti-programmed cell death-1 (PD-1)–based antitumor immune responses using a syngeneic murine model of B16 melanoma. Both BLT1−/− and CXCR3−/− mice showed significantly enhanced tumor growth and reduced survival compared with WT mice in melanoma and breast cancer models. 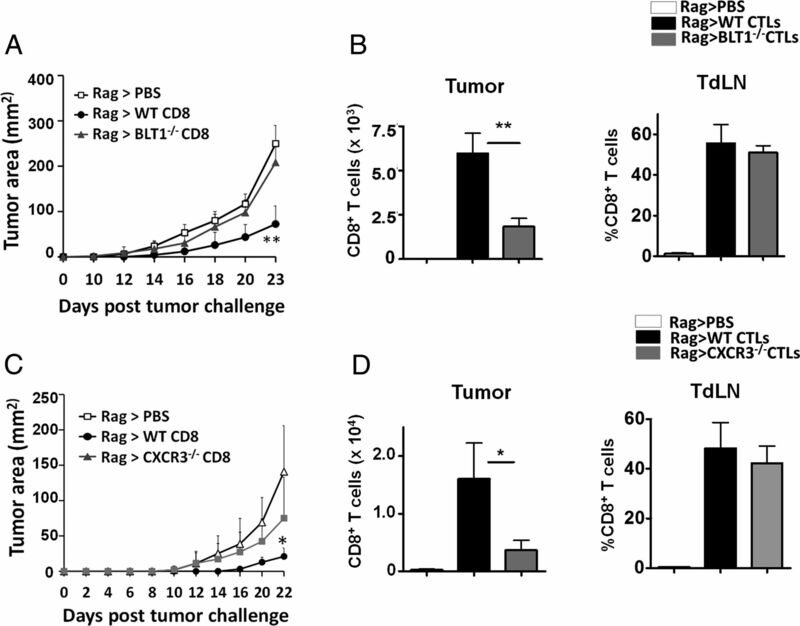 Analysis of tumor-infiltrating leukocytes and adoptive transfer experiments in Rag2−/− mice revealed the importance of BLT1 and CXCR3 expression on CD8+ T cells for generating effective antitumor immunity. An anti–PD-1 Ab immunotherapy significantly reduced the tumor growth in WT mice but was completely ineffective in both BLT1−/− and CXCR3−/− mice. The inability of the vaccine to enhance T cell migration in the knockout (KO) mice suggested an obligate and nonredundant requirement for both BLT1 and CXCR3 in T cell migration to tumors and anti–PD-1 Ab–induced antitumor immunity. C57BL/6 mice, CXCR3−/− mice, and UBC-GFP mice in a C57BL/6 background (6–7 wk old) were purchased from The Jackson Laboratory and/or bred in our animal facility at the University of Louisville. Previously described BLT1−/− mice in a C57BL/6 background were also bred in our animal facility at the University of Louisville (48). Rag2−/− mice in a C57BL/6 background were purchased from Taconic (Germantown, NY). BLT1−/−CXCR3−/− double KO (DKO) mice were generated by crossing BLT1−/− and CXCR3−/− mice at our animal facility. All animals were cared for in accordance with institutional and National Institutes of Health guidelines and under Institutional Animal Care and Use Committee protocol. The B16 melanoma cell line and E0771 breast cancer cell line were purchased from the American Type Culture Collection (Manassas, VA) and cultured in complete RPMI 1640 media supplemented with 10% FBS. Fluorochrome-conjugated anti-mouse Abs (anti–CD45.2-PE-Cy7, anti–CD3-allophycocyanin-Cy7, anti–CD4-allophycocyanin, anti–CD8-PerCP-Cy5.5, NK1.1-PE, CD11b-allophycocyanin, Ly6G-PE, Ly6C-FITC, IFN-γ allophycocyanin, TNF-α allophycocyanin-Cy7, anti–CXCR3-PE, streptavidin-allophycocyanin, and 7-AAD) were purchased from BD Pharmingen and eBioscience. Annexin VFITC was purchased from BioLegend. Trp-2 peptide (Trp2180: SVYDFFVWL) was purchased from Peptide 2.0. Anti–murine OX-40 agonistic Ab (clone OX-86) and anti–murine PD-1 antagonistic Ab (clone RMP1-14) were purchased from Bio X Cell. Anti-mouse BLT1 Ab conjugated to biotin was developed in the laboratory (S. Mathis and B. Haribabu, unpublished data). WT, BLT1−/−, CXCR3−/−, and BLT1−/−CXCR3−/− mice were challenged with 105 live B16 melanoma cells or in certain experiments 105 E0771 cells by reconstituting in 200 μl of PBS and injecting s.c. at the right flank of naive mice to form tumors. For low tumor–dose experiments, 4 × 104 live B16 cells were injected s.c. Tumor diameter was measured every alternate day using a caliper. Average tumor diameter was calculated by measuring two perpendicular diameters, and tumor area was calculated by multiplying the two perpendicular diameters. For survival experiments, tumors in mice were allowed to reach 15 mm in diameter, and once they did the mice were considered dead. Percentage survival was calculated and plotted using Kaplan–Meier survival plots. Tumor-bearing animals were euthanized once the tumors reached 15 or 7–9 mm in diameter or earlier when they showed any signs of discomfort. For vaccine studies, WT, BLT1−/−, CXCR3−/−, and BLT1−/−CXCR3−/− mice were challenged with 105 live B16 cells s.c. on the right flank on day 0. On days 5 and 15 after tumor challenge, the mice were vaccinated i.v. with 50 μg/mouse Trp-2 peptide and 100 μg/mouse anti–PD-1 antagonistic Ab (clone RMP1-14; Bio X Cell). The control mice were administered with PBS. The tumor growth was monitored every alternate day. The mice were euthanized when the KO animals or the control unvaccinated animals reached 15-mm tumor diameter. Tumors, blood, spleen, and tumor draining lymph nodes (TdLNs) were then analyzed for CD8+ T cells by flow cytometry. Tumors were harvested and cut into small pieces after removal of connective tissue and tissue stroma. To obtain a single-cell tumor suspension, the small tumor pieces were incubated in an enzyme mixture consisting of collagenase A (2 mg/ml) and DNase I (1 mg/ml) in incomplete RPMI 1640 medium for 1 h at 37°C on a rocking platform. After 1 h of digestion, the single-cell suspension was obtained by passing the digested tissue through a 40-μm nylon mesh and the resultant cells were washed twice in PBS before staining for flow cytometry. Cells were stained with fluorochrome-labeled anti-mouse Ab such as CD45.2, CD3, CD4, CD8, NK1.1, CD11b, Ly6G, and Ly6C. Two million total tumor cells were stained and analyzed using multiparameter flow cytometry. Similarly, spleen and TdLNs (inguinal, brachial, and axillary) were harvested, processed into a single suspension, stained, and analyzed via flow cytometry. For intracellular cytokine staining, single-cell suspensions from tumor, spleen, and TdLNs were stimulated with cell stimulation mixture (500× used at 1×; eBioscience) consisting of PMA (40.5 μM), ionomycin (670 μM), and protein transport inhibitors brefeldin A (5.3 mM) and monensin (1 mM) for 6 h at 37°C, 5% CO2. After 6 h the cells were harvested and washed, surface stained with CD45, CD3, and CD8, and fixed and permeabilized (intracellular fixation and permeabilization buffer; eBioscience) and stained for IFN-γ and TNF-α using anti–murine IFN-γ Ab and anti–murine TNF-α Ab (BD Biosciences). Isotype controls with the same fluorochrome were used as controls. Cells were acquired using a FACSCanto II machine and analyzed by FlowJo (Tree Star) software. To analyze the percentages of CTLs undergoing apoptosis, single-cell suspensions from tumors were stained with CD45, CD3, and CD8 Abs. Apoptosis was evaluated using standard 7-AAD and Annexin VFITC staining protocols and analyzed by flow cytometry. The percentages of 7-AAD+annexin V+ cells of total CD8+ T cells were determined in tumor cell suspensions obtained from tumor-bearing WT, BLT1−/−, and CXCR3−/− mice once tumors reached 5 mm in diameter. For BLT1 and CXCR3 staining, single-cell suspensions from TdLNs were obtained from tumor-bearing vaccinated or unvaccinated WT mice. The mice were sacrificed and TdLNs were harvested 3 d after the second vaccine dose administration according to the vaccine design. Single-cell suspensions were stained with 2 μl of biotinylated anti-mouse BLT1 Ab developed in the laboratory and incubated at 4°C for 1 h. The cells were washed with 1× PBS plus 0.1% BSA and further stained with 1 μl of streptavidin-allophycocyanin and other Abs against CD45, CD3, CD8, and CXCR3 for 1 h at 4°C. Suitable isotype controls with the same fluorochrome were used. Cells were then washed and acquired using the FACSCanto II machine and analyzed by FlowJo (Tree Star) software. Immunofluorescence staining for CD8+ T cells in the tumors of WT, BLT1−/−, and CXCR3−/− mice was analyzed using Nikon A1R confocal microscope. Tumors were embedded in OCT medium and snap frozen in liquid nitrogen and later cut into 5-μm sections using a cryostat. Sections were fixed using ice-cold acetone and then blocked using 1× PBS supplemented with 3% BSA and 5% goat serum for 1 h at room temperature. To stain for CD8+ T cells, the sections were incubated with rat anti-mouse CD8a Ab (BD Pharmingen) in 1× PBS plus 3% BSA for 1 h at room temperature. After three washes with PBS, the sections were then incubated with the secondary Ab goat anti-rat Alexa Fluor 594 (2 mg/ml, Invitrogen). After washing with PBS, the sections were mounted with Vectashield mounting medium containing DAPI (Vector Laboratories) and analyzed at ×200 magnification. A minimum of four fields for each tumor section was analyzed. A standard in vivo cytotoxicity assay was performed by injecting peptide-pulsed target cells into immunized mice as previously described (47). Briefly, WT, BLT1−/−, CXCR3−/−, and BLT1−/−CXCR3−/− recipient mice were immunized s.c. with 50 μg/mice of Trp-2 peptide and an adjuvant, that is, 100 μg/mouse anti–OX-40 agonistic Ab (clone OX-86, Bio X Cell). Seven days later, C57BL/6 splenocytes were divided into CFSEhigh and CFSElow populations by staining with 2.5 and 0.25 μM CFSE fluorescent dye. CFSEhigh cells were pulsed with 2 μg/ml Trp-2 peptide. CFSEhigh and CFSElow cells were extensively washed and mixed at 1:1 ratio and injected i.v. into the immunized WT, BLT1−/−, and CXCR3−/− mice. Their spleens were harvested after 2 d and analyzed by flow cytometry to determine the ratio of CFSEhigh/CFSElow target cells and percentage killing. The percentage of in vivo killing was calculated by the following formula: [1 − (CFSEhigh/CFSElow for experimental/CFSEhigh/CFSElow for naive)] × 100. Rag2−/− immune-deficient mice were challenged s.c. with 1 × 105 live B16 cells. Two days later, CD8+ T cells were isolated from the spleen and TdLNs of tumor-bearing WT, BLT1−/−, CXCR3−/−, or BLT1−/−CXCR3−/− mice by magnetic sorting using CD8a-Ly2 microbeads (Miltenyi Biotec) with >98% purity. One million purified CD8+ T cells were injected i.v. into the Rag2−/− mice challenged with live B16 tumors and vehicle alone (PBS was used as the control). Tumor growth was monitored every alternate day. Animals were euthanized once they reached 15-mm tumor diameter and TdLNs as well as tumors were analyzed for CD8+ T cell numbers. For cotransfer experiments, UBC-GFP mice were used as WT mice to distinguish between WT and KO (non-GFP) CD8+ T cells. Rag2−/− mice were challenged with 105 live B16 cells. Two days later, CD8+ T cells were isolated from tumor-bearing WT (UBC-GFP), BLT1−/−, CXCR3−/−, and BLT1−/−CXCR3−/− mice. One million total CD8+ T cells consisting of WT (GFP+) and either BLT1−/−, CXCR3−/−, or BLT1−/−CXCR3−/− CD8+ T cells were injected into Rag2−/− mice in equal proportions and tumor growth was monitored. Animals were euthanized once tumors reached 7–9 mm in diameter. Spleen, blood, TdLNs, and tumors were harvested and CD8+ T cells were analyzed for GFP+ (WT) and GFP− (KO) populations. WT, BLT1−/−, and CXCR3−/− mice were immunized with Trp2 peptide and OX-86 adjuvant s.c. to obtain Ag-specific responses. Seven days later mice were sacrificed and spleen and draining lymph nodes were harvested. Pooled cells were activated for 5 d in U-bottom 96-well plates coated with anti-mouse CD3e Ab (2 μg/ml, clone 145-2C11; BD Biosciences) and anti-mouse CD28 (2 μg/ml, clone 37.51; eBioscience) in complete media for 48 h and maintained in recombinant human IL-2 (20 ng/ml; PeproTech) for 5 d. The cells were then used for chemotaxis assays or for BLT1 and CXCR3 staining using flow cytometry. Chemotaxis was performed for murine WT, BLT1−/−, and CXCR3−/− CTLs in response to media alone, 10 nM LTB4, 10 nM CXCL10, and both 10 nM LTB4 and CXCL10 (PeproTech). The assay was performed in 24-well plates with 5-μm pore size Transwell inserts (Corning). Media (RPMI 1640 plus 1% FBS) containing chemokines or media alone were placed in the bottom chamber. A half million activated CD8+ T cells were placed in the upper chamber. After 3 h of incubation at 37°C, the cells that migrated to the lower chamber were counted using a hemocytometer. Tumors from WT unvaccinated and vaccinated mice were harvested after 3 d after the second vaccine dose was administered. The tumors were homogenized in 500 μl 1× PBS buffer containing 10 μM indomethacin using an Omni GLH general homogenizer. The homogenates were centrifuged at 14,000 × g for 15 min and supernatants were collected. LTB4 was measured using the EIA kit (Cayman Chemical) according to the manufacturer’s instructions. CXCL9 (MIG) and CXCL10 (IP-10) were measured using Quantikine ELISA kits (R&D Systems) according to the manufacturer’s instructions. CXCL9, CXCL10, and LTB4 were expressed as picograms per gram of tumor tissue. Total RNA from the excised tumors was isolated using TRIzol followed by an RNase mini prep kit from Qiagen. The RNA was treated with DNase using a Turbo DNAse kit (Ambion). For quantitative real-time PCR, 1 μg of total RNA was reverse transcribed in 50 μl of TaqMan reverse transcription reagents (Applied Biosystems) using random hexamer primers. A total of 2 μl of cDNA and the 1 μM real-time PCR primers were used in a final 20-μl PCR reaction with Power SYBR Green master mix (Applied Biosystems). The real-time primers for granzyme B and GAPDH were purchased from Real Time Primers (Elkins Park, PA). The sequence of the primers will be provided upon request. Real-time PCR reaction was performed in a Bio-Rad CFX96 real-time system. Expression of the target genes was normalized to GAPDH and displayed as fold change relative to the WT sample. Data are representative of tumors isolated from at least five different mice for each genotype. Statistical analysis was done using the Student t test and Mann–Whitney U test. The survival assays were analyzed using long-rank test in GraphPad Prism software. Student t tests were used for comparisons between two experimental groups, with a p value < 0.05 considered significant (***p < 0.001, **p < 0.01, *p < 0.05) using GraphPad Prism software. Error bars represent ±SEM. An essential role for BLT1 in immune surveillance against tumors and antitumor immunity in a viral Ag–derived TC-1 cervical cancer model was recently demonstrated (47). To determine the requirement for BLT1 and CXCR3 in mediating antitumor immunity in an autologous (nonviral) tumor model, a syngeneic spontaneous B16 melanoma mice model was used. WT, BLT1−/−, and CXCR3−/− mice were s.c. challenged with either a lethal tumor dose (105 cells) or sublethal tumor dose (4 × 104 cells) of B16 cells. BLT1−/− and CXCR3−/− mice showed significantly enhanced tumor growth as compared with the WT mice at both doses of tumor challenge (Fig. 1A, 1B) and significantly reduced survival as compared with the WT mice at the low dose (Fig. 1C). At the sublethal tumor dose, both BLT1−/− and CXCR3−/− mice demonstrated 100% mortality by day 28 after tumor challenge; however, 50% of the WT mice still survived after day 40, with all of them developing relatively slow-growing tumors (Fig. 1C). To explore whether similar phenotypes are seen in other solid tumor types, WT, BLT1−/−, and CXCR3−/− mice were challenged with 105 E0771 cells. Similar to melanoma, in this breast cancer model the BLT1−/− and CXCR3−/− mice demonstrated significantly enhanced tumor growth compared with WT mice (Supplemental Fig. 1). These results suggest that both BLT1 and CXCR3 may be crucial for immune surveillance and generating an endogenous antitumor response. 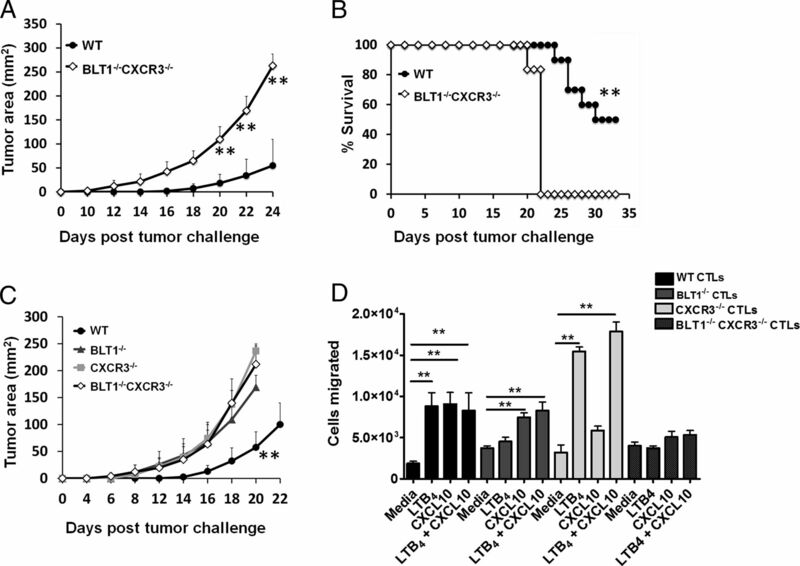 Enhanced tumor growth and reduced survival in BLT1−/− and CXCR3−/− mice. (A) WT, BLT1−/−,and CXCR3−/− mice were challenged s.c. with 105 B16 cells (high dose). Tumor area was determined by multiplication of two perpendicular diameters (length × width); n = 9 for each group. (B) WT (n = 10), BLT1−/− (n = 7), and CXCR3−/− (n = 8) mice were challenged s.c. with 4 × 104 B16 cells (low dose) and the tumor area was calculated. (C) Survival in the low-dose challenge group was monitored until day 45 after tumor challenge. Log-rank test and Kaplan–Meier methods were used for survival analyses and Student t tests were used for tumor sizes. (A) Data are representative of three independent experiments. (B and C) Data are representative of two independent experiments. **p < 0.01, ***p < 0.001. To explore the basis for enhanced tumor growth in the KO mice, leukocyte subpopulations in tumors, spleen, and TdLNs of tumor-bearing WT, BLT1−/−, and CXCR3−/− mice were analyzed by flow cytometry. WT, BLT1−/−, and CXCR3−/− mice were challenged with 1 × 105 B16 cells and the tumors were harvested when the KO tumors reach 7–9 mm (midsized) in tumor diameter. Single-cell suspensions were obtained from the tumor, spleen, and TdLNs and stained with CD45.2 for all immune cell populations and CD3, CD4, and CD8 for T cells, NK1.1 for NK cells, and CD11b, Ly6G, and Ly6C for myeloid cell populations. The BLT1−/− and CXCR3−/− tumors showed significant reduction in CD8+ T cell numbers as compared with WT tumors (Fig. 2A). Moreover, CXCR3−/− tumors, but not BLT1−/− tumors, had significant reduction in CD4+ T cells and NK cells as compared with the WT tumors (Fig. 2A). To ensure that reduced CTL numbers are not a function of differential tumor sizes, TIL infiltration studies were carried out in size-matched tumors. Similar reductions in CD8+ T cell numbers in tumors of KO mice as compared with WT mice were observed in size-matched (at the end stage) tumors as well (Supplemental Fig. 2A). Immune cell profiling in the spleen and TdLNs revealed that KO mice had similar percentages of CD8+ T cells, CD4+ T cells, and NK cells as compared with WT mice (Fig. 2B, 2C). Myeloid cell populations constitute a significant part of the tumor microenvironment. Analysis of CD11b+ myeloid cells and myeloid-derived suppressor cell (MDSC) subsets, that is, CD11b+Ly6G+ (granulocytic-MDSC) and CD11b+Ly6C+ (monocytic-MDSC) in the tumors of WT, BLT1−/−, and CXCR3−/− mice showed no significant difference (Supplemental Fig. 2B). The significant reduction in CD8+ T cells in the tumors of BLT1−/− and CXCR3−/− mice was confirmed by immunofluorescence staining and confocal microscopy (Fig. 2D). These results suggest that enhanced tumor growth in BLT1−/− and CXCR3−/− mice may be related to the reduced numbers of CD8+ T cells as compared with tumors of WT mice. Reduced infiltration of CD8+ T cells in BLT1−/− and CXCR3−/− tumors. (A) Numbers of tumor-infiltrating CD4+ T cells, CD8+ T cells, and NK1.1+ cells per million total tumor cells (frequency of total) were analyzed from WT, BLT1−/−, and CXCR3−/− mice using standard flow cytometry protocol as described in Materials and Methods. All the mice were sacrificed and tumors harvested when the KO tumors reached 7–9 mm in tumor diameter. (B) CD4+, CD8+, NK1.1+ staining in TdLNs of size-matched tumor-bearing WT, BLT1−/−, and CXCR3−/− mice. Data are represented as percentage of total CD45+ cells. (C) CD4+, CD8+, NK1.1+ staining in spleens of size-matched tumor-bearing WT, BLT1−/−, and CXCR3−/− mice. Data are represented as percentage of total CD45+ cells. (D) Representative immunofluorescence staining images of CD8+ T cells in WT, BLT1−/−, and CXCR3−/− tumors. Tumors harvested were frozen, sectioned, and stained as described in Materials and Methods; CD8 is represented in red, DAPI in blue. The images were captured using a Nikon A1R confocal microscope. Scale bars, 50 μm. Data are representative of three independent experiments. *p < 0.05, **p < 0.01. ns, not significant. To determine whether the significant reduction in CD8+ T cell numbers in the tumors of BLT1−/− and CXCR3−/− mice was not due to differential survival rates, we performed staining of apoptosis markers 7-AAD and annexin V. The percentages of 7-AAD+annexin V+ cells of total CD8+ T cells in tumors from WT and KO mice were determined. 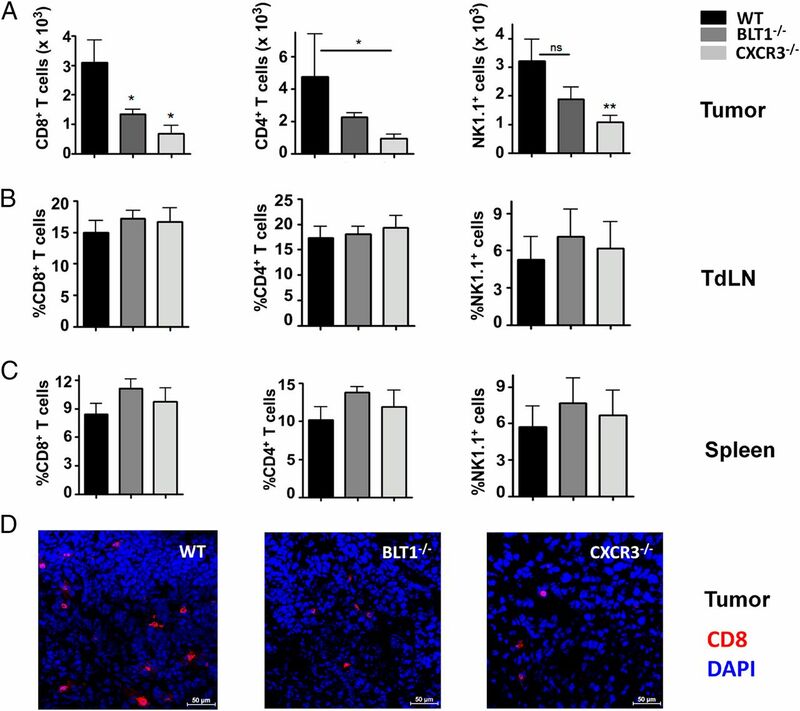 There was no significant difference between WT, BLT1−/−, and CXCR3−/− CD8+ T cells undergoing apoptosis in the tumor microenvironment (Supplemental Fig. 3A). Thus, lack of BLT1 and CXCR3 does not affect the survival of CTLs in the tumor milieu; however, their migration into the tumors from periphery is significantly abrogated. Given that BLT1 and CXCR3 are essential for homing into tumors, we sought to determine whether the effector functions were also controlled by BLT1 and CXCR3. Transcript expression levels of a CTL effector molecule, namely granzyme B, in tumors was significantly reduced in tumors of BLT1−/− and CXCR3−/− mice as compared with WT mice as shown by RT-PCR (Supplemental Fig. 3B). No significant difference was observed in the killing abilities of the CD8+ T cells in the spleens of WT, BLT1−/−, and CXCR3−/− mice (Supplemental Fig. 3C). To measure their cytotoxic function within the tumor, levels of IFN-γ, an effector cytokine, was determined in the CD8+ T cells by intracellular cytokine staining. The percentage of IFN-γ+ cells of total CD8+ T cells in the tumors of CXCR3−/− mice was significantly reduced as compared with WT mice, but this percentage remained similar in the tumors of BLT1−/− mice (Supplemental Fig. 3D). In contrast, the percentages of IFN-γ+ cells of total CD8+ T cells in spleens and TdLNs of tumor-bearing WT, BLT1−/−, and CXCR3−/− mice were similar (Supplemental Fig. 3D). Interestingly, CXCR3−/− CD8+ T cells showed intact TNF-α production in the tumor as also in spleen and TdLNs (Supplemental Fig. 3D). These studies suggest that BLT1−/− and CXCR3−/− CTLs do not have an intrinsic defect in effector functions. However, CXCR3−/− CTLs may have defective effector function in the tumor microenvironment, specifically in the IFN-γ axis. To further examine the importance of BLT1 and CXCR3 expression on CD8+ T cells for effective infiltration to tumors, an adoptive transfer model involving Rag2−/− mice was used. Rag2−/− mice were challenged with 105 B16 cells and 2 d later were adoptively transferred with tumor-educated sorted (>98% pure) WT or BLT1−/− CD8+ T cells and the tumor growth was recorded. PBS transferred tumor-bearing Rag2−/− mice served as controls. WT CD8+ T cells significantly reduced the tumor progression in Rag2−/− animals. However, BLT1−/− CD8+ T cells failed to reduce the tumor growth and showed tumor growth kinetics similar to those of control Rag2−/− mice without any transferred CD8+ T cells (Fig. 3A). CTL infiltration studies showed that BLT1−/− CTLs were significantly reduced in tumors of Rag2−/− mice as compared with WT CTLs, albeit remaining similar in the TdLNs (Fig. 3B), suggesting a defect in tumor infiltration of BLT1−/− CTLs. Similar studies were carried out with WT and CXCR3−/− CTLs. CXCR3−/− CTLs also failed to retard tumor growth in Rag2−/− mice. This defective antitumor response was attributed to significantly reduced levels of CXCR3−/− CTLs in the tumors, with their levels remaining similar in the TdLNs (Fig. 3C, 3D). These studies demonstrate that expression of both BLT1 and CXCR3 on CTLs is necessary for their effective infiltration to tumors and subsequent antitumor immunity. Adoptive transfer of WT but not BLT1−/− or CXCR3−/− tumor-experienced CD8+ T cells retarded tumor growth in Rag2−/− mice. Rag2−/− mice were challenged with 105 B16 cells. Two days later CD8+ T cells were isolated from the spleen and TdLNs of B16 tumor-bearing (3–5 mm) WT, BLT1−/−, or CXCR3−/− mice by MACS technique and 1 million isolated CD8+ T cells (>98% purity) or PBS was injected i.v. in tumor-inoculated Rag2−/− mice. (A) Tumor growth kinetics for Rag2−/− mice transferred with either PBS (n = 5), WT CD8+ T cells (n = 5), or BLT1−/− CD8+ T cells (n = 5). (B) Numbers of CD8+ T cells (frequency of total) per 1 million total tumor cells and percentage of CD8+ T cells of total CD45+ cells in TdLNs for WT and BLT1−/− transferred CD8+ T cells are shown. (C) Tumor growth kinetics for Rag2−/− mice transferred with either PBS (n = 4), WT CD8+ T cells (n = 5), or CXCR3−/− CD8+ T cells (n = 4). (D) Numbers of CD8+ T cells (frequency of total) per 1 million total tumor cells and percentage of CD8+ T cells of total CD45+ cells in TdLNs for WT and CXCR3−/− transferred CD8+ T cells are shown. Data are representative of two independent experiments. *p < 0.05, **p < 0.01. To examine the interdependence of BLT1 and CXCR3 in generating anti-tumor immunity, BLT1−/−CXCR3−/− DKO were generated by crossing BLT1−/− and CXCR3−/− mice. The BLT1−/−CXCR3−/− mice were born at the expected Mendelian ratios and displayed normal developmental and morphological features. At the sublethal dose of B16 cells (4 × 104), BLT1−/−CXCR3−/− mice showed significantly enhanced tumor growth as well as significantly reduced survival as compared with WT mice (Fig. 4A, 4B). There was 100% mortality of BLT1−/−CXCR3−/− mice by day 22, whereas 50% of WT mice still survived at day 35 after tumor challenge (Fig. 4B). To compare the tumor growth kinetics in DKO versus either of the single KO mice, WT, BLT1−/−, CXCR3−/−, and BLT1−/−CXCR3−/− mice were challenged with 105 B16 cells and the tumor growth was recorded. 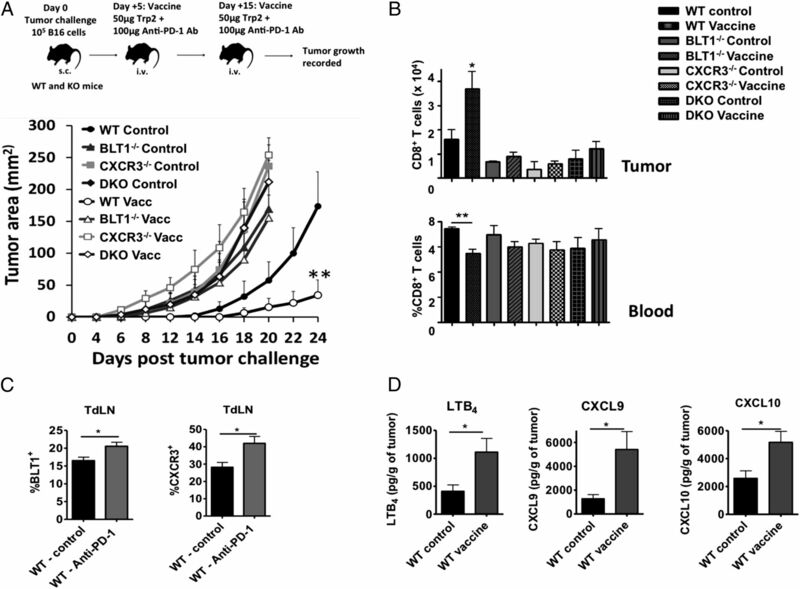 The BLT1−/−CXCR3−/− mice displayed significantly enhanced tumor growth kinetics as compared with WT mice but similar growth kinetics as compared with BLT1−/− or CXCR3−/− mice (Fig. 4C). No significant enhancement in the tumor growth was observed in the DKO mice as compared with either of the single KO mice. These results suggest that BLT1- and CXCR3-mediated regulation of antitumor immunity may be codependent but not additive or synergistic. Defective immune surveillance and antitumor immunity in BLT1−/−CXCR3−/− DKO mice. (A) WT (n = 10) and BLT1−/−CXCR3−/− (n = 6) mice were challenged s.c. with 4 × 104 B16 cells (low dose) and the tumor area was calculated. Tumor area was measured by multiplication of two perpendicular diameters (length × width). (B) Survival in the low-dose challenge group was monitored until day 35 after tumor challenge. (C) WT (n = 4), BLT1−/− (n = 5), CXCR3−/− (n = 4), and BLT1−/−CXCR3−/− (n = 6) mice were challenged s.c. with 105 B16 cells (high dose). Log-rank test and Kaplan–Meier methods were used for survival analyses and Student t tests were used for tumor sizes. Data are representative of two independent experiments. (D) No further enhancement in CTL migration was observed in response to both LTB4 and CXCL10. Chemotaxis with activated CTLs was performed as indicated in Materials and Methods. The migration of CTLs was determined in response to LTB4 (10 nM), CXCL10 (10 nM), or LTB4 and CXCL10 (10 nM each) in combination. Migration in response to media alone (RPMI 1640 plus 1% FBS) served as control. A half million WT, BLT1−/−, CXCR3−/−, and DKO CTLs were loaded onto the upper chamber and appropriate ligands were placed in the lower chamber and the measurements were carried out in triplicates. The data represent cells migrated in response to respective ligands. Data are representative of two independent experiments. **p < 0.01. To determine whether there is a dependence of BLT1 receptor on CXCR3 (and vice versa) to achieve efficient CTL migration, we performed ex vivo chemotaxis assays. Activated WT, BLT1−/−, and CXCR3−/− CD8+ T cells were prepared and chemotaxis was performed as described in Materials and Methods. The results showed that BLT1−/− CTLs migrate to CXCL10 and CXCR3−/− CTLs migrate to LTB4 to a similar extent as compared with WT CTLs. This suggests that CXCR3 is functional in BLT1-deficient CTLs and BLT1 is functional in CXCR3-deficient CTLs. The results also suggest that LTB4 and CXCL10 collectively do not further enhance the CTL chemotaxis (Fig. 4D). This is in line with the results obtained with DKO mice wherein there was no further enhancement of tumor growth in the absence of both BLT1 and CXCR3 compared with either alone. To determine whether BLT1 and CXCR3 receptors are expressed on the same cells, we performed BLT1 and CXCR3 staining on ex vivo–activated CTLs. Receptor expression studies indicated that almost all in vitro–activated CTLs (92.3%) are CXCR3+, of which ∼31% are BLT1+ (Supplemental Fig. 4). To determine whether WT CTLs could facilitate KO CTL infiltration to tumors by production of cytokines/chemokines, the migration patterns of the WT and KO CD8+ T cells cotransferred into Rag2−/− mice were studied. Equal proportions of tumor-experienced WT CD8+ T cells and BLT1−/−, CXCR3−/−, or BLT1−/−CXCR3−/− (DKO) CD8+ T cells were introduced i.v. into tumor-bearing Rag2−/− mice. UBC-GFP mice were used as WT mice to differentiate between WT (bright green fluorescence) and the KO CD8+ T cells (Fig. 5A). CD8+ T cells were stained in tumor, blood, spleen, and TdLNs once the tumor reached 7–9 mm diameter and the ratio of WT to KO CD8+ T cells was assessed. The ratios of WT to KO CTLs in TdLNs were similar across all the groups and close to 1–1.5 (Fig. 5B). WT CD8+ T cells infiltrated into tumors ∼3-fold more as compared with BLT1−/− CD8+ T cells, ∼8-fold more as compared with CXCR3−/− CD8+ T cells and ∼5.5-fold more as compared with BLT1−/−CXCR3−/− CD8+ T cells (Fig. 5C). These studies suggest that WT cells do not facilitate additional KO CTL infiltration to tumors. WT CD8+ T cells do not facilitate KO CD8+ T cell infiltration to tumors. UBC-GFP mice were used as the WT mice in this experiment to differentiate between WT and KO CTLs. Rag2−/− mice were challenged with 105 B16 cells. Two days later CD8+ T cells were isolated from the spleen and TdLNs of tumor-bearing (3–5 mm) WT (UBC-GFP), BLT1−/− (non-GFP), CXCR3−/− (non-GFP), and BLT1−/−CXCR3−/− (non-GFP) mice by MACS technique. A half million WT (GFP+) CD8+ T cells were either mixed with a half million BLT1−/−, CXCR3−/−, or BLT1−/−CXCR3−/− (DKO) CD8+ T cells and were injected i.v. in Rag2−/− mice. Animals were sacrificed when the tumors reached 7–8 mm in tumor diameter. The percentage of WT and KO CD8+ T cells were determined upon gating on live CD8+ T cells and looking for GFP+ and GFP− populations, respectively. (A) Representative dot plots of GFP+ (WT) and GFP− (KO) CTLs transferred in tumor-inoculated Rag2−/− mice and corresponding cumulative graph of ratio of percentage WT/percentage KO CTLs injected, which is equal to 1. (B) Representative dot plots of percentage WT and percentage KO CTLs obtained from TdLNs of Rag2−/− mice when the tumor reaches 7–8 mm in tumor diameter. The percentage GFP+ and percentage GFP− is shown after gating on CD8+ T cells. Cumulative bar graph demonstrating the ratio of percentage WT/percentage KO CTLs in TdLNs is also shown. (C) Representative dot plots of percentage WT and percentage KO CTLs obtained from tumor of Rag2−/− mice when the tumor reaches 7–8 mm in tumor diameter. The percentage GFP+ and percentage GFP− are shown after gating on CD8+ T cells. Cumulative bar graph demonstrating the ratio of percentage WT/percentage KO CTLs in TdLNs is also shown. Bar in black represents WT plus BLT1−/− CTL mix, gray bars represent WT plus CXCR3−/− CTL mix, and light gray bars represent WT plus DKO CTL mix. Data are representative of two independent experiments for each transferred combination with n = 5 in each experimental group. **p < 0.01. ns, not significant. Next, the importance of BLT1 and CXCR3 in anti–PD-1 Ab-enhanced antitumor immune response was determined. WT, BLT1−/−, CXCR3−/−, and BLT1/CXCR3−/− mice were challenged with 105 B16 cells s.c. on day 0 followed by vaccine administration on days 5 and 15. Although the vaccine did not completely eradicate the tumors in WT mice, there was a significant reduction in the tumor growth kinetics in WT mice. However, the vaccine completely failed to delay tumor growth in the BLT1−/−, CXCR3−/−, and BLT1/CXCR3−/− animals (Fig. 6A). The vaccine efficacy correlated with CD8+ T cell infiltration to tumors, with significantly reduced CTL infiltration in tumors of KO mice upon vaccination. As expected, the vaccine decreased CTL numbers in the blood of WT mice as a reflection of the concurrent increase in the CTLs in tumors of WT mice (Fig. 6B). The percentages of CD8+ T cells in the TdLNs and spleens of the KO animals were comparable to those of the WT animals in both the vaccinated and unvaccinated cohorts (data not shown). Obligate requirement of BLT1 and CXCR3 for optimum efficacy of anti–PD-1 Ab-based immunotherapy. WT (unvaccinated, n = 4; vaccinated, n = 6), BLT1−/− (unvaccinated, n = 5; vaccinated, n = 5), CXCR3−/− (unvaccinated, n = 3; vaccinated, n = 5), and DKO (unvaccinated, n = 6; vaccinated, n = 5) mice were s.c. challenged with 105 B16 cells and left either unvaccinated (PBS) or vaccinated with Trp-2 peptide (50 μg) and anti–PD-1 Ab (100 μg) twice i.v. on days 5 and 15 after tumor inoculation. (A) Tumor area measured by multiplication of two perpendicular diameters in unvaccinated and vaccinated WT, BLT1−/−, CXCR3−/−, and DKO mice is shown. (B) Cumulative bar graph representing CD8+ T cell numbers per million total tumor cells (frequency of total) in unvaccinated and vaccinated WT, BLT1−/−, CXCR3−/−, and DKO mice is represented. Cumulative bar graph representing percentage CD8+ T cells (frequency of CD45+ cells) in blood of these mice is also shown. Data are representative of two independent experiments. (C) BLT1+ and CXCR3+ CTLs are enhanced upon PD-1 blockade. WT tumor-bearing mice underwent PD-1 blockade immunotherapy or no immunotherapy as control. The mice were sacrificed and TdLNs were obtained 3 d after booster vaccine dose. BLT1 and CXCR3 staining on CTLs were carried out as mentioned in Materials and Methods. Cumulative bar graph showing percentages of BLT1+ and CXCR3+CD8+ T cells (frequency of CD8+ T cells) is shown (n = 5 in each group). Data are representative of two independent experiments. (D) Enhanced LTB4, CXCL9, and CXCL10 levels in tumor after PD-1 blockade immunotherapy. LTB4, CXCL9, and CXCL10 measurements in tumors from WT vaccinated and unvaccinated were carried out as mentioned in the Materials and Methods. Cumulative bar graphs representing LTB4, CXCL9, and CXCL10 as picograms per gram of tumor tissue is shown. n = 5 in each group. Data are representative of two independent experiments. *p < 0.05, **p < 0.01. To determine whether BLT1 and CXCR3 receptor expression on CTLs is affected by vaccine treatment, CD8+ T cells were stained for BLT1 and CXCR3 5 d after booster vaccine treatment. The percentages of BLT1+ and CXCR3+ populations were significantly enhanced in total CD8+ T cells from TdLNs upon PD-1 blockade (Fig. 6C). To understand the levels of ligand expression in the tumors upon PD-1 blockade, tumors from WT unvaccinated and vaccinated mice were homogenized and the tumor supernatants were analyzed for LTB4 by enzyme immunoassay and CXCL9 and CXCL10 by ELISA as described in Materials and Methods. The results suggest that PD-1 blockade significantly enhanced the expression of BLT1 and CXCR3 ligands in the tumor milieu (Fig. 6D). These results suggest that optimum efficacy of anti–PD-1 Ab relies on both BLT1 and CXCR3 chemoattractant pathways for effective CTL-mediated antitumor immunity. Cancer immunotherapies rely on achieving stronger and long-lasting effector CD8+ T cell responses in the tumor. A major obstacle for attaining this goal is the inefficient migration of CD8+ T cells into the tumor (12, 17). The results presented in the present study, using murine melanoma and breast cancer models, suggest that both BLT1 and CXCR3 are independently required for CD8+ T cell migration to tumors and sustained antitumor immunity. In the absence of either of these receptors, there is a breach in achieving an effective antitumor response. Although BLT1 is expressed on a variety of leukocytes, there is a preferential BLT1-mediated recruitment of certain cells under specific disease conditions. For example, Th2 and CD8+ T cell infiltration is preferred during airway hyperresponsiveness in asthma, T cells in autoimmune uveitis, macrophages in diet-induced obesity and atherosclerosis, and neutrophils in silica-induced lung cancer promotion; in all of these models, genetic deletion of BLT1 was shown to be protective (42–46, 49, 50). Recently, we demonstrated a crucial antitumor role of BLT1 in mediating CD8+ T cell recruitment to tumors using TC-1 cervical cancer model wherein BLT1-deficient mice showed enhanced tumor growth and reduced survival compared with WT mice (47). Lack of CTL infiltration to tumors can delay an antitumor response in other types of cancers as well. In the present study, we investigated the role of BLT1 in autologous B16 melanoma (51) and in the E0771 breast cancer model. This suggests that BLT1-mediated regulation of CTL infiltration may be important across a variety of immunogenic solid tumor types, including cervical cancers, melanoma, and breast cancers. Previous studies have reported a protumorigenic role of the BLT1–LTB4 pathway in various tumors types, including melanoma (52–56). In contrast, our studies highlight the importance of BLT1 on immune cells (CTLs) in achieving an effective antitumor response. Moreover, the data presented in the present study suggest that in the absence of BLT1, major CTL chemokine receptors, such as CXCR3, that have been demonstrated to be indispensable for T cell trafficking at the tumor vasculature (29) cannot achieve optimum CTL infiltration to tumors and antitumor immunity. In a GM-CSF gene-transduced leukemia model, Yokota et al. (56) showed that BLT1 KO mice showed similar or better primary and recall immune responses that were attributed to a reduced MDSC population in the tumors of BLT1-deficient mice and robust CD4 dependent antitumor responses. The divergence in the results observed in the present study may be due to the differences in the mouse strains (BALB/c), tumor model (leukemia), and expression of GM-CSF in the tumor cells (56). In our model, we did not find any difference in the numbers of CD4+ T cells, NK cells, or myeloid cells in the tumors of BLT1−/− mice. However, the helper contributions of CD4+ T cells and NK cells in CD8+ T cell–mediated antitumor immunity may not be excluded. Hence, BLT1-mediated recruitment of various immune cells at specific locations in different tumor models is key to the type of inflammation (protumor or antitumor) that accrues. In melanoma, BLT1-mediated CD8+ T cell infiltration to tumors is a crucial mechanism for effective antitumor immunity. The role of CXCR3 and the ligands CXCL9 and CXCL10 in antitumor immunity is well established (29, 34, 57, 58). In a recent study, Mikucki et al. (29) elegantly demonstrated that CXCR3-mediated signaling is a critical and indispensable checkpoint for tumor Ag-specific CD8+ T cells to traffic across the tumor vasculature for carrying out effective tumoricidal activity in mice and human melanoma. CTL chemokine receptors CCR5 and CCR2 were not essential for CXCR3-mediated CTL extravasation across tumor vessels despite the presence of CCL2 and CCL5 chemokines in the tumor milieu. Using an Ag-specific B16/OVA–OT-I system and ACT setting, they showed that WT OT-I but not CXCR3−/− OT-I CTLs were able to significantly reduce tumors, with 50% of WT OT-I transferred mice showing complete tumor regression. 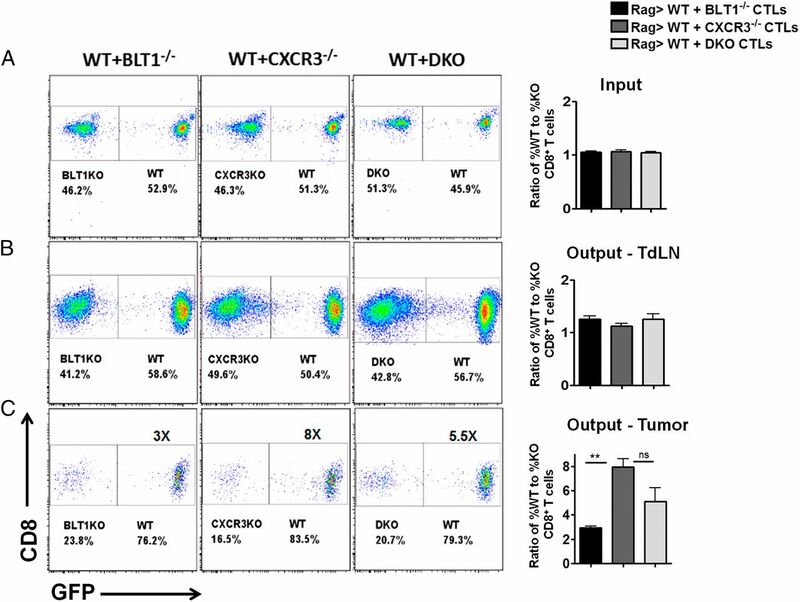 Consistent with their study, our data from tumor kinetics in WT versus CXCR3−/− mice as well as adoptive transfer of tumor-educated WT or CXCR3−/− CTLs suggest an indispensable role for CXCR3 in mediating CTL recruitment. Moreover, in the present study, we also demonstrated that both CXCR3−/− and BLT1−/− mice are completely unresponsive to PD-1 blockade–based immunotherapy. In line with this, our data suggest an additional indispensable requirement for BLT1 for endogenous antitumor immunity and therapeutic efficacy. Mikucki et al. (29) demonstrated an essential role for CXCR3 in mediating firm adhesion of tumor Ag-specific CD8+ T cells at the tumor vessels while not affecting the rolling property of the CTLs. However, at what juncture of the multistep trafficking process BLT1 is required on CD8+ T cells for homing into tumors remains to be determined. The results in the present study suggest that low CTL numbers in tumors seen in BLT1−/− and CXCR3−/− mice are not due to enhanced susceptibility to apoptosis of the KO CTLs in the tumors (Supplemental Fig. 3A), but they are likely due to a migration defect, as there is no difference in the survival of WT, BLT1−/−, and CXCR3−/− CTLs in the tumors. With respect to the functionality of the CD8+ T cells in the tumor microenvironment, CXCR3 expression plays a crucial role in IFN-γ secretion, as CXCR3−/− CTLs in the tumors have a defect in IFN-γ production. Various other studies have shown similar defects in IFN-γ production of CXCR3−/− T cells (28, 59, 60). A perturbed amplification loop in IFN-γ production due to reduced effector cell infiltration or increased suppressive function of M2 macrophages in CXCR3−/− mice may be the reason for defective IFN-γ production in CXCR3−/− CD8+ T cells (61, 62). Thus, expression of CXCR3 on CTLs appears crucial for their effector functions in tumors. Leukocytes express several chemoattractant receptors in overlapping patterns and respond to multiple chemoattractant cues that may be present at the target tissue. Using a simplified two-dimensional agarose-based system that integrated sequential exposure to IL-8 and LTB4, it was shown that neutrophils can migrate up a primary gradient of IL-8 into a disorienting concentration but later could effectively retain the capacity to resume migration to a secondary gradient of LTB4, suggesting a potential for step-by-step navigation in complex chemoattractant fields (63). Hence, two chemoattractant pathways specific for the same cell may function together rather than being redundant to effectively recruit immune cells. Receptor expression studies indicated that almost all in vitro–activated CTLs (92.3%) are CXCR3+, of which ∼31% are BLT1+. Alternatively, all BLT1+ CTLs are also CXCR3+ (Supplemental Fig. 4). Our studies suggest that BLT1 and CXCR3 seem to play an essential, nonredundant, cell-autonomous role in collectively mediating CD8+ T cell infiltration to tumors and antitumor immunity. We examined the combinatorial regulation of CTL infiltration to tumors by BLT1 and CXCR3 via generation of BLT1/CXCR3 DKO mice. The data presented in the present study suggest a lack of synergism in BLT1 and CXCR3, as there was no further enhancement of tumor growth in the DKO mice compared with either of the single KO mice. Similar migration of ex vivo–activated WT CTLs in response to both LTB4 and CXCL10 as compared with either LTB4 or CXCL10 alone suggests lack of synergism. Studies in an arthritis model revealed that BLT1-mediated infiltration of WT neutrophils in BLT1−/− mice facilitated infiltration of endogenous BLT1−/− neutrophils to the inflamed joint, suggesting that BLT1 expression on neutrophils is essential only for the initial recruitment and other chemokines could then perpetuate the disease progression (64). However, our cotransfer experiments with WT and individual KO CTLs revealed that WT CTLs do not facilitate additional BLT1−/− or CXCR3−/− CTL infiltration to tumors, suggesting that BLT1- and CXCR3-mediated signaling cannot be bypassed by other chemoattractant systems for CTL migration into tumors. These results suggest that BLT1 and CXCR3 signaling pathways do not act in a synergistic manner. However, neither BLT1 nor CXCR3 can be bypassed, and an intact antitumor response requires both BLT1 and CXCR3 signaling for efficient CTL migration to tumors. Mikucki et al. (29) demonstrated a crucial role of CXCR3 in migration of CTLs to tumors using short-term migration assays to assess migration aspect of CTLs alone, not letting other parameters such as survival, retention, and egress to interfere. However, in our endogenous tumor model (not OVA–OT-1 system), we were unable to detect WT or KO CTLs in the tumor after 2 h of CTL transfer. It is plausible that in our system migration of CTLs to tumors follows a different kinetics due to self-antigens compared with OVA-specific OT-1 cells. Blockade of the PD-1 pathway has been a promising antitumor immunotherapy in humans (65–68). Anti–PD-1 Ab therapy was shown to enhance infiltration of adoptively transferred T cells (68). We used the PD-1 blockade-based vaccine model to assess the involvement of BLT1 and CXCR3 in achieving PD-1 blockade-based efficacy. PD-1 blockade in conjunction with Trp-2 peptide showed similar efficacy compared with PD-1 blockade alone (data not shown). Hence, it seems that Ag-specific stimulation is not required for PD-1 blockade efficacy. Although enhancing CD8+ T cell numbers in tumors and thus reducing tumor growth in WT mice, the vaccine lost its efficacy in mice lacking either or both BLT1 and CXCR3 receptors. Additionally, PD-1 blockade significantly enhanced the expression of LTB4, CXCL9, and CXCL10 in the tumors as well as enhanced the percentage of BLT1+ and CXCR3+ CTLs in TdLNs, suggesting a mechanism by which there may be enhanced T cell infiltration in tumors upon vaccination (Fig. 6). The CTLs from the tumors, however, did not show any detectable expression of BLT1 or CXCR3 (data not shown). Previous studies have shown that chemoattractant receptors get internalized in cells when they reach the site of inflammation (47, 49). Recent studies on patients treated with PD-1 inhibitors suggest that the responsiveness to PD-1 blockade depends on a certain threshold of CD8+ T cell densities in the tumors. Mutational landscape of the tumor dictates whether the tumor assumes a T cell–inflamed (presence of CTLs) or a non-T cell–inflamed phenotype (absence of CTLs) and responsiveness to therapy (69). The data presented in the present study suggest yet another mechanism that governs T cell–inflamed or non-T cell–inflamed tumor phenotype. In the absence of either or both BLT1 and CXCR3 receptors, there is a defect in T cell infiltration leading to a non-T cell–inflamed tumor that fails to respond to PD-1 blockade therapy. In a lung metastatic melanoma model, melanoma cells were shown to be a source for CXCL9 and CXCL10 production. Among the immune cells, CD4+ T cells were considered the major producers of CXCL9 as well as IFN-γ in the metastatic nodules in lung (34). Although most myeloid cells can readily produce LTB4, the source of this BLT1 ligand in the B16 tumors remains to be determined. Taken together, these results suggest critical and nonredundant roles for BLT1 and CXCR3 in regulating CTL migration to tumors and antitumor immunity. By targeting these receptor pathways the efficacy of current immunotherapy approaches including ACT and PD-1 blockade may be enhanced. We thank Becca Baby for support of animal colony maintenance. This work was supported by National Institutes of Health Grant R01 CA138623 (to B.H.) and by funding from the James Graham Brown Cancer Center (to B.H.) and an American Association of Immunologists Careers in Immunology Fellowship (to Z.S.C.).
. 2013. Spatiotemporal dynamics of intratumoral immune cells reveal the immune landscape in human cancer. Immunity 39: 782–795.
. 2005. Intraepithelial CD8+ tumor-infiltrating lymphocytes and a high CD8+/regulatory T cell ratio are associated with favorable prognosis in ovarian cancer. Proc. Natl. Acad. Sci. USA 102: 18538–18543.
. 2011. Tumor-infiltrating lymphocytes: apparently good for melanoma patients. But why? Cancer Immunol. Immunother. 60: 1153–1160.
. 2013. Tumor-infiltrating CD14-positive myeloid cells and CD8-positive T-cells prolong survival in patients with cervical carcinoma. Int. J. Cancer 133: 2884–2894.
. 2008. Favorable outcome in clinically stage II melanoma patients is associated with the presence of activated tumor infiltrating T-lymphocytes and preserved MHC class I antigen expression. Int. J. Cancer 123: 609-615.
. 2014. Antibody-modified T cells: CARs take the front seat for hematologic malignancies. Blood 123: 2625–2635.
. 2014. Exploiting the curative potential of adoptive T-cell therapy for cancer. Immunol. Rev. 257: 56–71.
. 2011. Expression of a functional CCR2 receptor enhances tumor localization and tumor eradication by retargeted human T cells expressing a mesothelin-specific chimeric antibody receptor. Clin. Cancer Res. 17: 4719–4730.
. 2006. Hurdles to lymphocyte trafficking in the tumor microenvironment: implications for effective immunotherapy. Immunol. Invest. 35: 251–277.
. 2015. Regulation of cytotoxic T-lymphocyte trafficking to tumors by chemoattractants: implications for immunotherapy. Expert Rev. Vaccines 14: 537–549.
. 2010. Gene-expression profiling in vaccine therapy and immunotherapy for cancer. Expert Rev. Vaccines 9: 555–565.
. 2014. Tumor endothelium FasL establishes a selective immune barrier promoting tolerance in tumors. Nat. Med. 20: 607–615.
. 2014. T-cell and NK-cell infiltration into solid tumors: a key limiting factor for efficacious cancer immunotherapy. Cancer Discov. 4: 522–526.
. 2013. Ways to enhance lymphocyte trafficking into tumors and fitness of tumor infiltrating lymphocytes. Front. Oncol. 3: 231.
. 2012. Role of chemokines and chemokine receptors in shaping the effector phase of the antitumor immune response. Cancer Res. 72: 6325–6332.
. 2005. The high expression of Fractalkine results in a better prognosis for colorectal cancer patients. Int. J. Oncol. 26: 41–47.
. 2008. Radiation-induced CXCL16 release by breast cancer cells attracts effector T cells. J. Immunol. 181: 3099–3107.
. 2004. Intratumoral CC chemokine ligand 5 overexpression delays tumor growth and increases tumor cell infiltration. J. Immunol. 173: 3755–3762.
. 2005. Gene therapy to manipulate effector T cell trafficking to tumors for immunotherapy. J. Immunol. 174: 5766–5773.
. 2002. RANTES expression is a predictor of survival in stage I lung adenocarcinoma. Clin. Cancer Res. 8: 3803–3812.
. 2011. Maximal T cell-mediated antitumor responses rely upon CCR5 expression in both CD4+ and CD8+ T cells. Cancer Res. 71: 5455–5466.
. 1998. The chemokine receptors CXCR3 and CCR5 mark subsets of T cells associated with certain inflammatory reactions. J. Clin. Invest. 101: 746–754.
. 2005. Autoreactive CD8+ T cells in multiple sclerosis: a new target for therapy? Brain 128: 1747–1763.
. 2009. Differential expression of the CXCR3 ligands in chronic hepatitis C virus (HCV) infection and their modulation by HCV in vitro. J. Virol. 83: 836–846.
. 2012. Chemokine guidance of central memory T cells is critical for antiviral recall responses in lymph nodes. Cell 150: 1249–1263.
. 2015. Non-redundant requirement for CXCR3 signalling during tumoricidal T-cell trafficking across tumour vascular checkpoints. Nat. Commun. 6: 7458.
. 2011. The emerging role of CXCL10 in cancer (Review). Oncol. Lett. 2: 583–589.
. 1996. Chemokine receptor specific for IP10 and mig: structure, function, and expression in activated T-lymphocytes. J. Exp. Med. 184: 963–969.
. 1993. IP-10, a -C-X-C- chemokine, elicits a potent thymus-dependent antitumor response in vivo. J. Exp. Med. 178: 1057–1065.
. 2002. Chemokines in cancer. Cytokine Growth Factor Rev. 13: 143–154.
. 2015. Melanoma induces, and adenosine suppresses, CXCR3-cognate chemokine production and T cell infiltration of lungs bearing metastatic-like disease. Cancer Immunol. Res. 3: 956–967.
. 2004. CXC chemokine receptor 3 expression by activated CD8+ T cells is associated with survival in melanoma patients with stage III disease. Cancer Res. 64: 7697–7701.
. 2010. Interferons induce CXCR3-cognate chemokine production by human metastatic melanoma. J. Immunother. 33: 965–974.
. 2005. Selective infiltration of CCR5+CXCR3+ T lymphocytes in human colorectal carcinoma. Int. J. Cancer 116: 949–956.
. 2005. Chemokine receptors support infiltration of lymphocyte subpopulations in human hepatocellular carcinoma. Clin. Immunol. 114: 174–182.
. 1987. Leukotrienes and lipoxins: structures, biosynthesis, and biological effects. Science 237: 1171–1176.
. 2004. Role of leukotriene B4 receptors in the development of atherosclerosis: potential mechanisms. Arterioscler. Thromb. Vasc. Biol. 24: 369–375.
. 2008. Corticosteroids enhance CD8+ T cell-mediated airway hyperresponsiveness and allergic inflammation by upregulating leukotriene B4 receptor 1. J. Allergy Clin. Immunol. 121: 864–871.e4. doi:10.1016/j.jaci.2008.01.035.
. 2011. Leukotriene B4 receptor-1 mediates intermittent hypoxia-induced atherogenesis. Am. J. Respir. Crit. Care Med. 184: 124–131.
. 2010. Nonredundant roles for leukotriene B4 receptors BLT1 and BLT2 in inflammatory arthritis. J. Immunol. 185: 3049–3056.
. 2011. Deficiency of the leukotriene B4 receptor, BLT-1, protects against systemic insulin resistance in diet-induced obesity. J. Immunol. 187: 1942–1949.
. 2015. Crystalline silica-induced leukotriene B4-dependent inflammation promotes lung tumour growth. Nat. Commun. 6: 7064.
. 2013. Expression of leukotriene B4 receptor-1 on CD8+ T cells is required for their migration into tumors to elicit effective antitumor immunity. J. Immunol. 191: 3462–3470.
. 2000. Targeted disruption of the leukotriene B4 receptor in mice reveals its role in inflammation and platelet-activating factor-induced anaphylaxis. J. Exp. Med. 192: 433–438.
. 2010. Lipid-cytokine-chemokine cascade drives neutrophil recruitment in a murine model of inflammatory arthritis. Immunity 33: 266–278.
. 2006. Blockade of the interaction of leukotriene b4 with its receptor prevents development of autoimmune uveitis. Invest. Ophthalmol. Vis. Sci. 47: 1543–1549. Overwijk, W. W., and N. P. Restifo. 2001. B16 as a mouse model for human melanoma. Curr. Protoc. Immunol. Chapter 20: Unit 20.21. doi:10.1002/0471142735.im2001s39.
. 2009. Leukotriene B4 creates a favorable microenvironment for murine melanoma growth. Mol. Cancer Res. 7: 1417–1424.
. 2013. Cancer-produced metabolites of 5-lipoxygenase induce tumor-evoked regulatory B cells via peroxisome proliferator-activated receptor α. J. Immunol. 190: 2575–2584.
. 2002. Leukotriene B4 receptor antagonist LY293111 inhibits proliferation and induces apoptosis in human pancreatic cancer cells. Clin. Cancer Res. 8: 3232–3242.
. 2007. Blockade of leukotriene B4 signaling pathway induces apoptosis and suppresses cell proliferation in colon cancer. J. Pharmacol. Sci. 103: 24–32.
. 2012. Absence of LTB4/BLT1 axis facilitates generation of mouse GM-CSF-induced long-lasting antitumor immunologic memory by enhancing innate and adaptive immune systems. Blood 120: 3444–3454.
. 2014. Chemokines in cancer. Cancer Immunol. Res. 2: 1125–1131.
. 2011. Chemotherapy induces intratumoral expression of chemokines in cutaneous melanoma, favoring T-cell infiltration and tumor control. Cancer Res. 71: 6997–7009.
. 2006. Severe disease, unaltered leukocyte migration, and reduced IFN-γ production in CXCR3−/− mice with experimental autoimmune encephalomyelitis. J. Immunol. 176: 4399–4409.
. 2012. CXCR3 chemokine receptor-ligand interactions in the lymph node optimize CD4+ T helper 1 cell differentiation. Immunity 37: 1091–1103.
. 2004. Allergic humans are hyporesponsive to a CXCR3 ligand-mediated Th1 immunity-promoting loop. FASEB J. 18: 329–331.
. 2014. CXCR3 deficiency enhances tumor progression by promoting macrophage M2 polarization in a murine breast cancer model. Immunology 143: 109–119.
. 1997. Multistep navigation and the combinatorial control of leukocyte chemotaxis. J. Cell Biol. 139: 1349–1360.
. 2014. The programmed death-1 immune-suppressive pathway: barrier to antitumor immunity. J. Immunol. 193: 3835–3841.
. 2013. Antagonist antibodies to PD-1 and B7-H1 (PD-L1) in the treatment of advanced human cancer. Clin. Cancer Res. 19: 1021–1034.
. 2012. PD-1 blockade enhances T-cell migration to tumors by elevating IFN-γ inducible chemokines. Cancer Res. 72: 5209–5218.
. 2015. Melanoma-intrinsic β-catenin signalling prevents anti-tumour immunity. Nature 523: 231–235.